I'm going to put some cute rosettes on it too but this particular one will be used for the Festival ofNativities. Thanks to Melanie over at Sugardoodle for helping me make my document into a pdf file. Learn something new everyday! So I can't help you with your image-posting problem - but I just realized that we are in the same town! I've been reading your blog for a while now (and I LOVE it! ), so what a surprise when I followed the Festival of Nativities link and saw where you are. I'm in the Van North Stake - I'm volunteering at the Festival...I'll look for your sign! Love it by the way! Yay! Actually you will see a bunch of them in my area. The area I'm decorating is in the center of the gym. No pressure...right? Come say hi! Thank you for posting all the cute things you make! I wish I had more time so I could make them all. I finally finished making a "joy". Not as cute as yours, but it makes me happy. How do you get the copy onto burlap? Nice word Kira!! Your little one is adorable too!! Just found your blog - loving it! Can't wait to spend some time exploring more of it! Thank you for the "Christ" printable. It is amazing! What a gorgeous sign!! I love it! I haven't ever seen printed burlap. Very cool. You are crazy ambitious to give one to all the primary teachers. Go YOU!! Love the burlap sign!!! Jesus is the reason for the season! I also love your blog and all of your crafts!!! Just found your blog and am drooling over all the craft ideas!! AMAZING!!! LOVE LOVE LOVE THIS! & Jesus TOO! How did you print it larger than a standard printer?? So precious of you to share this. 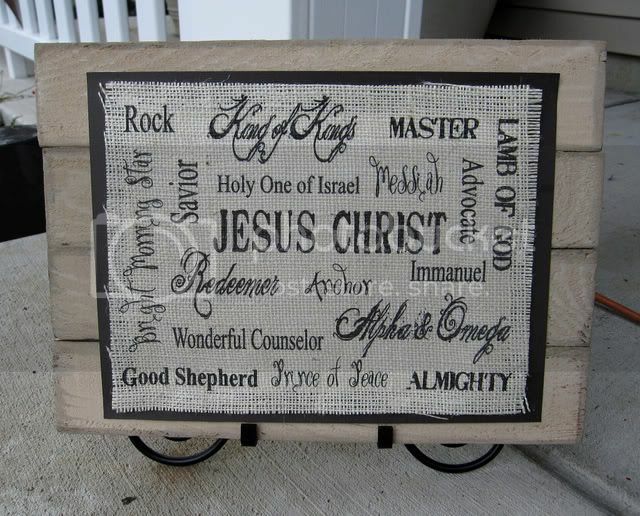 I was looking for something to make as gifts for bible study and teachers with materials I already have. This is so perfect. Now if I can figure out how to use yur template. Im new with the crafts :) God Bless You.